Derry-Londonderry:Gateway to a New World. Database of over 500 directories. As John Meagher fromThe Independent.ie discovers, researchers here atEneclann are hard at work digitising the records of Ireland’s World War I dead. Brian Donovan, Eneclann CEO, talks about how soldiers and civilians of every nationality were slaughtered in their millions. This month our speaker isMaeve Mullin, B.Sc. Finding Forgotten Irish WWI Soldiers: a case-study of Glaslough, co. Monaghan. In this workshop Maeve Mullin uses as a case-study, her own community of Glaslough, county Monaghan, to recover the names and personal histories of locals that fought and died in WWI. 3pm on Thursday 5th June, in the Emmet Theatre, Arts Block Trinity College, and2pm on Saturday 7th June, in the Trustee’s Room, National Library of Ireland, Kildare St. Even as the centenary commemorations for WWI begin, historians still can’t agree on the number of Irish war dead. The official figures are 49,300, but even these have been challenged as being both too low, and too high. In this workshop Maeve Mullin will guide you through the maze of sources that document the Irish men and women that fought and died in the First World War. Using individual stories, Maeve demonstrates how even a ‘burnt’ service record, can retain enough evidence to allow researchers to link up to other related records. “In researching the WWI soldiers from Glaslough I discovered a wealth of records. The workshop will focus on how this can be achieved for everyone’s home place. All workshops are free, but as spaces are limited, these are ticketed events. To apply for a free ticket, please emailworkshop@localhost and indicate whether you want to attend the workshop taking place in Trinity College or the National Library. This week we caught up with Maeve Mullins who will also be giving a talk at The UCC Genealogy School. Have a lookhere at the line up for this amazing summer school. Derry~Londonderry: Gateway to a New World – The story of emigration from the Foyle by sail and steam has just been published in the US by genealogist and Irish emigration expert Brian Mitchell. Brian Mitchell recounts the history of departures from the port of Derry-Londonderry from the late 17th century to the year 1939, when the last transatlantic steamer sailed from the port. Derry is ideally situated at head of the River Foyle, twenty-four miles long and only two miles wide at its head, a configuration that provided sailing vessels with a harbor of refuge. During the age of steam, her westerly situation gave her a monetary advantage with coal-burning vessels. 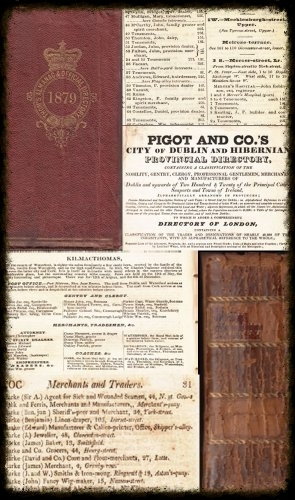 Shane Wilson andJoe Buggy have recently released aDatabase of over 550 links to Historic Directories of Ireland available on free and subscription websites,it also includes directories for purchase on CD or download. Details shown include directory date, titles byEneclann,findmypast andOrigins.net and a direct link to relevant website. Online directories may be available as transcripts, ebooks (pdf, FlipBook etc), images or searchable databases. To access the database,click here. We have teamed up with Tony Hennessy ofGreat Great Great Family Trees to offer you the perfect finishing touches to your family tree. 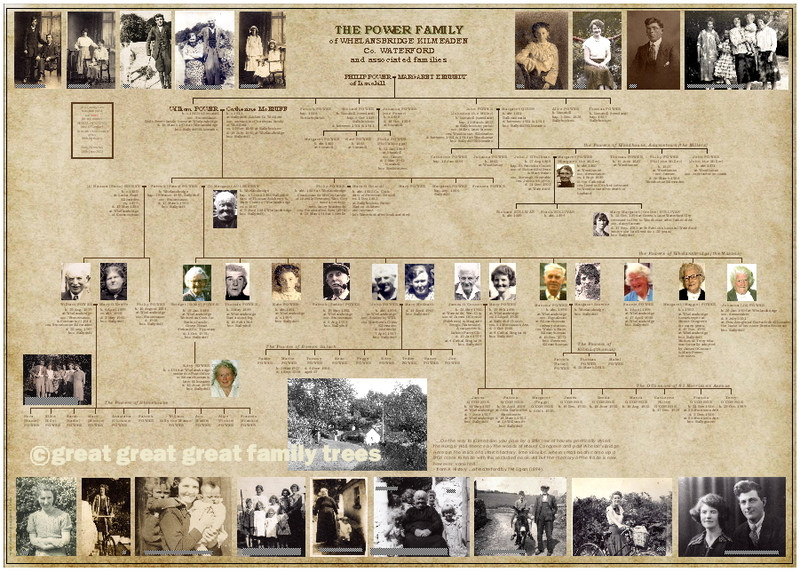 AfterEneclann have researched your family tree and created a genealogical report for you or perhaps you have carried out your own genealogical investigations, why not let Tony Hennessy from “Great Great Great Family Trees” turn the findings into a handsome family tree. A simple, functional family tree can provide visual clarity to a densely populated report. A ‘presentation’ type family tree, which is ideal for framing, can be admired, cherished, shared and passed on. It also makes a very thoughtful gift for some one special. One of the positive ‘side-effects’ of the digital revolution in family history, is that we expect to find out more about an individual or family than ever before. Our research-team are frequently asked if it’s ever possible to discover anything about an ancestor’s personality? Like all Irish research, this depends very much on the records that have survived down to the present day. Anyone lucky enough to have letters or a diary will expect to be able to discern something of the writer’s personality. Even marginal notes in a family bible or scribbled on the back of photos can sometimes communicate your ancestors’ inner thoughts and feelings. Other sources where you may find flashes of personality include newspaper accounts, particularly where the story covers dramatic events in which an ancestor was an eye-witness, and in the testimony recorded in court records. Even in the most structured official records, you will occasionally find flashes of personality. While the 1911 Census return of the De Valera family may reveal something of their household politics. Nobody told Sineád, Bean DeValera that she wasn’t joint ‘head of family’ with her husband. She was joint signatory of the original 1911 Census return, to the obvious horror of the enumerator, who scratched out her name and inserted a ‘correct tick’ beside her husband’s signature. 1884 Valuator Geo. Innes[? ],Drumahaire, co. Leitrim, Union of Manorhamilton. By: Eneclann Research Director, Fiona Fitzsimons. This entry was posted in Uncategorized and tagged 1930'3 how to Trace your roots, advice, archive, Brian Donovan, Brian Mitchell, competitions, Derry~Londonderry: Gateway to a New World, email, Eneclann, expert workshop talks, Family History, Family Tree designs, findmypast, Fiona Fitzsimons, Genealogy, genealogy school, genealogyday2014, historic directories, independent.ie, Ireland, Irish, Joe Buggy, Lorna Moloney, Maeve Mullins, news, newsletter, nli, online, publications, Reseacrh tips, research, Research experts, research tip., Shane Wilson, subscribe, subscription, The Genealogy Event, Trinity College, UCC, world war I.